What is an ecological community and what kinds of interactions take place within it? How important are the various categories of species interactions, including mutualisms, commensalisms, competition and predation? What kinds of interactions among species become important when many species affect one another? An ecological community is defined as a group of actually or potentially interacting species living in the same place. A community is bound together by the network of influences that species have on one another. Inherent in this view is the notion that whatever affects one species also affects many others -- the "balance of nature". We build an understanding of communities by examining the two-way, and then the multi-way, interactions involving pairs of species or many species. Food webs are graphical depictions of the interconnections among species based on energy flow . Energy enters this biological web of life at the bottom of the diagram, through the photosynthetic fixation of carbon by green plants. Many food webs also gain energy inputs through the decomposition of organic matter, such as decomposing leaves on the forest floor, aided by microbes. River food webs in forested headwater streams are good examples of this. Energy moves from lower to higher trophic (feeding) levels by consumption: herbivores consumes plants, predators consume herbivores, and may in turn be eaten by top predators. Some species feed at more than one tropic level, hence are termed omnivores. Figure 1 provides a simplified model of such a food web. We can look at this food web in two ways. It can be a diagram of the flow of energy (carbon) from plants to herbivores to carnivores, and so on. We will take this approach when we examine energy flow in ecosystems. 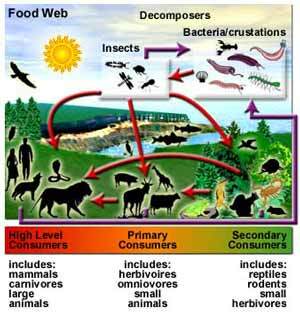 In addition, members of a food web may interact with one another via any of the four interaction types named above. An interaction between two species in one part of the web can affect species some distance away, depending on the strength and sign of the inter-connections. Often, adding a species (as when an exotic species invades a new area) or removing a species (as in a local extinction) has surprisingly far-reaching effects on many other species. This is due to the complex inter-connections of species in ecological webs. Ecologists use the following terms to describe various categories of the effects of a change (in abundance, or presence vs absence) of one species on another. Direct effects refer to the impact of the presence (or change in abundance) of species A on species B in a two-species interaction. Indirect effects refer to the impact of the presence (or change in abundance) of species A on species C via an intermediary species (A --> B --> C). Cascading effects are those which extend across three or more trophic levels, and can be top-down (predator --> herbivore --> plant) or bottom-up (plant --> herbivore --> predator). Keystone species are those which produce strong indirect effects. The keystone species concept is one of the best-known ideas in community ecology. Although it is true that many species potentially interact with one another in a food web such as depicted in Figure 1, in nature there are big players and little players. The biggest players of all are referred to as keystone species. This is a species whose presence or absence, or substantial increase or decrease in abundance, profoundly affects other species in the community. Evidence usually comes from experiments in which one species is added to or removed from a community. The name derives from the center stone in an arch supporting its weight by inward-leaning stones. Removal of the keystone causes the arch to collapse. In the rocky inter-tidal zone of Washington state, and in other, similar areas, starfish have been shown to be keystone species The entire community lives on relatively vertical rock faces in the wave-swept inter-tidal zone. The community of marine invertebrates and algae are adapted to cling or adhere to the rock face, where most fed upon the small animal life suspended in the water (plankton). A bivalve, the mussel Mytilus, is superior at attaching to rock faces, making it the competitive dominant. 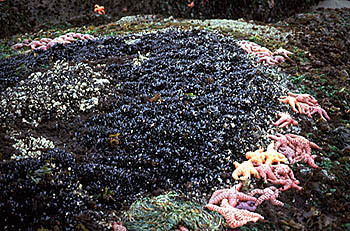 A starfish (Pisaster) is an effective predator of the mussels, making space available for other species, and consequently is critical to maintaining a diverse biological community. Instances are known where a predator so strongly suppresses its prey (herbivores), that the trophic level below (plants) benefits because it is released from the pressures of herbivory. Such “top-down” trophic cascades, where the community looks more or less ‘green’ depending on the abundance of predators, are well-known in lakes. We also know of examples where fertilizing a system, which increases plant growth, results in more predators, through the increase in abundance of herbivores. This is a “bottom-up” trophic cascade. Our understanding of these complex species interactions gives substance to the popular phrase, the “balance of nature”. One can also appreciate how a human-induced removal of one species (an extinction event) or the addition on one species (invasion of a community by a non-native species) could result in harm to many additional species, a topic we will consider in the second semester. We will gain a fuller appreciation of the complex, multi-way interactions among species as we proceed through this series of lectures. However, we can fully appreciate the complexity of these multi-way interactions, it is helpful to first understand the nuances of the various two-way interactions. We will develop our understanding of species interactions in ecological communities based on these building blocks. A mutualism is an interaction where both sides benefit. Pollination is a common mutualistic interaction. The plant gains gamete transfer, the animal gets nectar (and also pollen). Facultative mutualisms are beneficial but not essential to survival and reproduction of either party. Obligate mutualisms are those that are essential to the life of one or both associates. We will examine an example of each. A fascinating facultative mutualism involves the Boran people of Africa, and a bird known as the honey guide. According to rock paintings, humans have collected honey in Africa for 20,000 years. H uman hunting parties are often joined by the greater honeyguide (Indicator indicator), which leads them to bee colonies. In unfamiliar areas, the average search time was 8.9 hr when unguided, but only 3.2 hrs when guided by the bird. Borans use fire and smoke to drive off the bees, break open the nest and remove the honey, but leave larvae and wax behind. The bird gains access to larvae and wax. The use of fire and smoke reduces the bird's risk of being stung, and humans increase accessibility of nests. According to the Borans, the honeyguide informs them of: direction, from the compass bearing of bird flight; distance, from the duration of the bird's disappearance and height of perch; and arrival, by the "indicator call". Birds and Borans can survive without the other, but each benefits from this facultative mutualism. 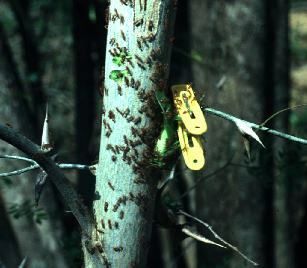 A mutualism between certain ants and a small tree, the acacia, provides an excellent example of an obligate mutualism. This particular system has been extensively studied in Costa Rica. The acacia provides a number of benefits to the ants, including shelter (hollow thorns), protein (beltian bodies at tip of leaflets), nectar (secreted near base of leaves). The ant (Pseudomyrmex) provides several forms of protection. It attacks and removes herbivorous insects, It also removes vines that might overgrow the acacia, and kills the growing shoots of nearby plants that might become competitors. It clears away leaf litter from near the plant, and since the acacia grows in a seasonally dry environment where it occasionally is threatened by fire, the ant's activities protect the tree from fire damage as well. Many other examples of mutualisms may be familiar to you. When one species benefits, and the other species is neither benefited nor harmed, the interaction is "+/0". In the southeastern US and in South America, it is common to see egrets in cattle pastures. They follow the cattle, eating insects that are dislodged or forced to fly as cattle graze in the field. One might suppose that egrets benefit cattle, by consuming insects that might compete with cows for food. The interaction would be a mutualism if this was demonstrated (but it seems a bit far-fetched). Assuming no benefit to the cattle, this is a commensalism. It often is the case, as this example illustrates, that we aren't sure if the interaction is "+/O" or "+/+". The clown fish and anemone also illustrates this point. The clown fish hides from enemies within the stinging tentacles of a sea anemone, to which the clown fish is immune. Some report this interaction as a mutualism, arguing that the clownfish drops scraps of food into the mouth of the anemone. Careful studies have failed to find much support for any benefit to the anemone, so this appears to be a commensalism. Species interactions within ecological webs include four main types of two-way interactions: mutualism, commensalism, competition, and predation (which includes herbivory and parasitism). Because of the many linkages among species within a food web, changes to one species can have far-reaching effects. We will next examine competition and predation, and then return to a consideration of more complicated indirect and cascading effects. Purves, W.K., G.H. Orians and H.C. Heller. Life: The Science of Biology. Sinauer, Sunderland MA.